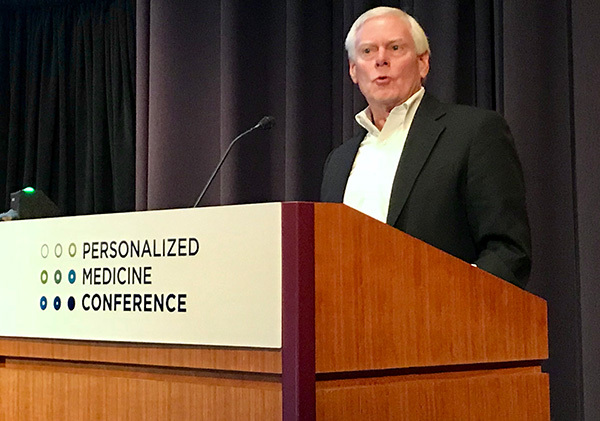 llumina executive chairman Jay Flatley used the mantle of receiving the Lifetime Acheivement Award at the Pesonalized Medicine Conference November 15, to frame his view of personalized medicine around the them of “shock and awe” in a keynote address. “I’m in awe of what we’ve accomplished [in genomic medicine],” he noted, “but find it shocking that we’ve limited the use of these tools” through over-regulation and other systemic issues. Flatley was introduced by Paul Billings, M.D., Ph.D. (a former competitor at Life Technologies), who described him as disruptive, smart, innovative, a job creator, and someone who has helped save many patient lives. “I’ve known Jay as a creative leader, a good listener, and a really good guy,” said Billings. Flatley dedicated his award to the 6000 Illumina employees. Under Flatley’s leadership, Illumina emerged as the foremost genome-sequencing platform, having bought the British company Solexa in 2006. Flatley said the company’s instruments could sequence a human genome for as little as $800, and Illumina has “foreshadowed a path to the $100 genome” in the next few years. The Novaseq instrument can sequence one genome per hour. The CRISPR/Cas9 gene-editing technology points to a day in the future when it is possible to eliminate most genetic disorders. “CRISPR germline editing is likely inevitable, but caution on that front is well advised,” Flatley said. Flatley also expressed awe at recent breakthroughs in therapeutics, noting 25 approved drugs are tailored to patient genetic profiles. “About 40% medicines in clinical trials could be classified as precision therapeutics,” said Flatley. In oncology, the figure rises to 75%. Returning to genomic medicine, Flatley saw huge promise in large-scale population genomics efforts to collect genomic and phenotypic data for both research and clinical application, supported by data federation and data sharing. The flagship project is Genomics England (GEL), which is a collection of 100,000 patients with rare diseases or cancer. The project committed to whole-genome sequencing three years ago. The pilot concludes at the end of 2018, and would become deeply embedded in the National Health Service. If at age 42, the individual complains of “feeling punk,” the general practitioner could query a deep learning system for patient matches with similar symptoms. A genetic diagnosis could lead to a tailored therapy, and the patient could quickly get back to work. Then at 65, a routine cancer blood test detects a cancer at Stage 0. Immunotherapy is prescribed, informed by microbiome sequencing to tailor therapy. “The doctor declares you cured in a month,” Flatley imagined. “This may sound [like] a pipe dream to some, especially if you work in the medical system,” Flatley said. But when someone of Flatley’s stature and accomplishment says it, it’s hard not to believe it.